'Tis the season for getting ready to document the holidays. For years, November means my creative brain is consumed with brainstorming and collecting product and ideas for my December album. I just love this time of year and I think the library of albums I've made since 2010 is a big reason why. In this post I am sharing how I've gotten ready, as well as my plans for documenting this December. My December albums range in size from 4x4 and 4x6 to 6x8. I love switching it up and this year is no different as I'll be using Jamaica Makes 3x8 acrylic covers. (She also has a fun frosted blue version in the Kelly Purkey Shop.) Ali Edwards page protectors fit perfectly in the album so I have some of the full 3x8 as well as the 4-pocket 6x8 protectors that I trimmed along the center vertical seam. I’m guessing based on the thickness of past albums that I’m going to need bigger binder rings. At the moment I think my color scheme this year is going to be white with pops of bold color. I’m primarily using the Holiday Tradition kit designed by Jamaica, available in the Kelly Purkey Shop. I’ve also pulled pieces of the Be Merry kit, since the product size goes well with this 3x8 album. I especially love the big tags, the letterpress cards and the stamp set. After I complete each year’s album, I go through my entire holiday stash and purge what I no longer want. I really don’t hold on to a lot of product as I often feel like I've overused something and am over it by that point. My albums and my style has changed over the years and right now I’m embracing a simpler approach because I know I work best with fewer choices. No decision fatigue for me. Everything is out on my desk in an IKEA Antonius basket - both kits, page protectors, stamp sets, stickers and alphas, ribbon and washi, and some loose embellishments. If I'm really stumped for more stuff, like veneer or sequins, I have a Raskog cart under my main work surface that I can dig into for that perfect embellishment. I also replaced my usual white thread in my sewing machine with red thread, and added gold thread to my supply bin as another option. A shallow bowl on my desk will hold memorabilia I collect during the month - instead of it getting lost in a random pile in my house. I’ve never chosen a theme for my December albums, but felt like I needed one this year. I shared earlier this year that my mom was battling cancer and in October, she passed away. Each day brings its challenges and it would have been really easy for me to say, “No, it’s too much. I’m going to skip making an album this year.” Despite the pain and sadness, I've decided to keep on with this tradition and chose the theme of JOY to carry me through. I’m choosing to see at least one joyful moment every day this month and use that as the jumping off point for my daily pages. You will be able to read more about that below in my album’s opening page. 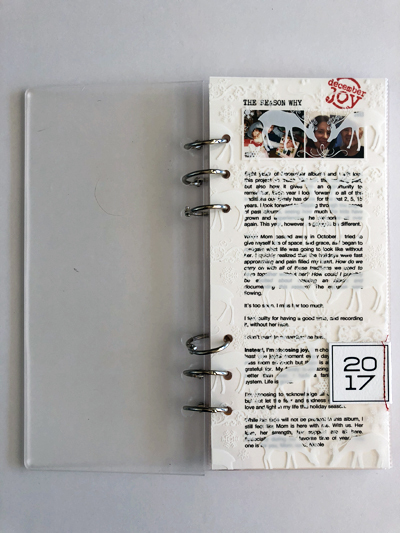 Because of the small size of my album, I didn’t prepare any foundation pages this year. I’m just going to mix up my page protectors, along with any full size product I have (like the big letterpress cards and tags) and make decisions on what to use each day based on my photo(s), journaling and stuff I collected. I did create an opening page though. 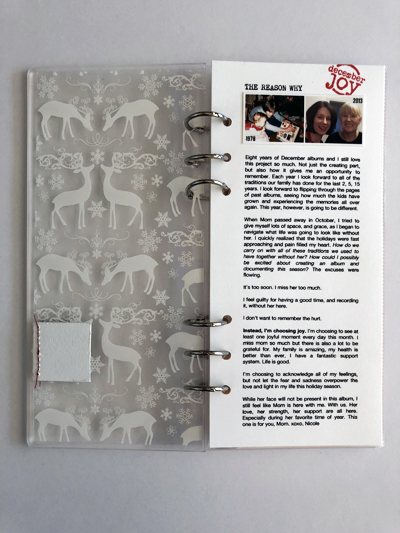 While my sister and I went through my mom’s craft supplies earlier this month, I found this reindeer Hambly transparency in her stash and jumped at the chance to use it (and not hoard it). I was going to trim it to 3x8 to slip in a page protector but wanted it to span the whole width of the album, so it is it’s own page behind the front cover. 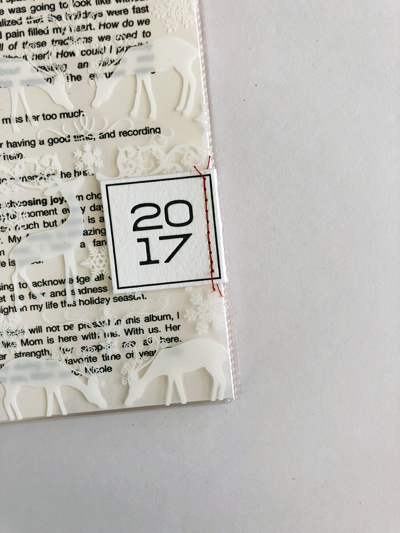 I cut down the 2017 letterpress card from the Holiday Tradition kit and folded it along the right side of the box to create a tab on the right edge of the transparency, then stitched it down with red thread on my sewing machine. Behind the Hambly is some journaling I wrote, inspired by Ali’s “reason why” page. Click an image below to scroll through + see it close-up. Each day will be contained within a 2-page spread, or 6”x8”. This small size is going to help me stay super intentional about what I include – photos and journaling first (and maybe just one or the other), product second. I think having a theme this year will help me stay on track as I ask myself daily, “What brought me joy today?” I only need to think of one thing. I printed a calendar for December to make notes of what I know we have plans for this month – like cutting down our tree, Mark’s work holiday party, Morgan’s choir concert – so those events will help me balance the big stuff with the everyday. What I do hope to do each day is spend time journaling about my day and make sure I have a photo to go along with it. After doing this project for 7 years, I know I will not keep up with creating daily. It doesn’t matter how simple I keep it. My plan is to work on a few days worth of pages every few days. It is easier for me to block out a bigger chunk of time (instead of one hour a day, for example) and it’ll help me conserve printing supplies. I print my photos from home and know I will save paper if I can print three 3x8 photos on a sheet of letter sized paper instead of just one at a time. Earlier this year I posted my completed 2016 album, but last week I filmed a video flip-through that you can watch here. Looking through my past albums is a part of my planning process because I like to see what I’ve already done and make notes of what I’d like to do again this year (or not do). You can also see my other past December albums in my gallery here. 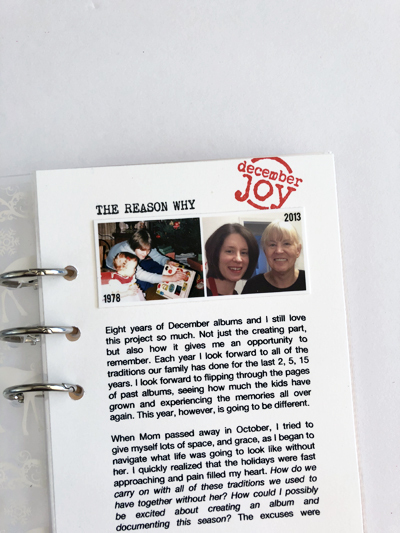 December Daily® is an annual memory-keeping project created by Ali Edwards. You can read more about it here.